You are at:Home»News»Ground zero for connected cars? Ground zero for connected cars? Honda officials say the intersection at Fifth and Main streets in Marysville is the ideal location to test its connected vehicle technology. The intersection has already been outfitted with a series of cameras and other technology, capable of communicating with units inside connected vehicles. Honda officials hope that the intersection at Main and Fifth streets in Marysville will serve as the epicenter for smart mobility in the world. Klaus said Honda is taking a dual track approach to advanced and smart mobility. He said Honda North America is working on smart and connected vehicle technology. Honda Japan is working on creation of the fully autonomous vehicle. “Holistically, global Honda is asking us, Honda North America, to lead in this partnership, this connected effort and then later, they will have the confidence to bring their automated, more advanced vehicles in here,” Klaus said. Honda has partnered with the 33 Smart Mobility Corridor Council of Governments to meet the vision. Through the partnership, with help from the state and federal government, is installing Dedicated Short Range Communications (DSRC) towers along U.S. 33 and at all 27 intersections in the city. Coupled with cameras at the intersections and units inside cars, vehicles will be able to interact with their environment. The first of the intersections, at Main and Fifth streets, already has the equipment installed. Klaus said intersection connects Honda’s smart vehicle technology, the “amazing infrastructure that Marysville has stepped forward to build” and the behavior of pedestrians, drivers, shoppers, and others on scooters or skateboards or other devices. He said the intersection is like many in every city in America. Cameras mounted on posts at the intersection are able to recognize pedestrians, vehicles and other objects. 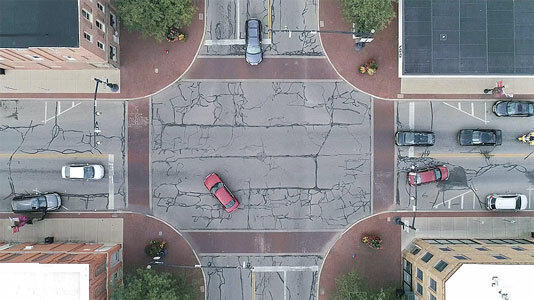 If a pedestrian is crossing the street against the light, the camera can recognize that and send a message to connected vehicles, slowing them down or stopping them. If a car fails to slow at a yellow light, the cameras can recognize that and send message to the light signal, delaying the green light for cross traffic until the other vehicle is safely through the intersection. Additionally, Honda is working on technology that will allow a dense group of vehicles to communicate with each other and with the environment. He likened it to a school of fish that swim together. They interact with each other and with the currents. He called it bio-mimicking. He said it will take a certain density of connected vehicles, but that technology, along with so many other advancements will be developed locally. He said it will be “technology that doesn’t exist in the world” other than in Marysville. “The approaches that we are taking here and the partnership we have, for Marysville, they are going to be this sleepy little typical town, with tremendous kind of integrity to the people and how they live their lives,” Klaus said. He said that several years ago, Marysville, Union County and the school district agreed to partner to build a fiber loop along U.S. 33 between Dublin and Transportation Research Center. With the local commitment, state officials got on board promising assistance and broadening the project. Weeks later, the federal government got on board. Meanwhile, Columbus won a national competition for smart mobility potential. Klaus said all the tumblers were falling into place. Local and state officials asked Honda to join the partnership and expand the scope of research in the corridor. Honda officials recognize that while developing technology is a challenge, it is not the greatest challenge to smart mobility. “We think it is a little immature to think we are going to just jump there by making really smart cars,” Klaus said. He said Honda realizes some people will be resistant to this type of technology. He said it is important to understand the attitudes of consumers and communities. Klaus said the relationships that Honda has with local officials and the community will help. While local residents will be able to watch as the technology develops, Klaus said it will also bring new people to the region. “We are going to need a lot of bright, young, excited people to come walk towards Honda as we walk toward the future,” Klaus said. Klaus says he is a car guy and is very proud of the work he did in helping to develop Honda’s super car, the Acura NSX. “But I am as excited, if not more, about this project ands what’s happening here, as I was about the NSX,” Klaus said.